Este artículo requiere usualmente de 2 a 3 días hábiles extras para ser procesado. 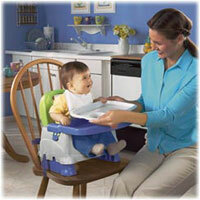 The Healthy Care Booster Seat has a feeding tray you can sanitize right in the dishwasher. 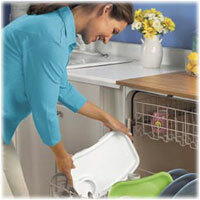 With the snap-on lid in place, the tray will stay clean until you're ready to use it. So you can take it wherever you go (it folds compactly) and always be sure that your baby is eating from a dishwasher-clean tray. Three height adjustments allow for a custom fit to any table. Front and rear seat straps adjust to fit virtually any chair and three-point harness adjusts to hold your growing child securely. Folds compactly for portability, with a carry strap so you can take it anywhere. (Weight limit: 45 pounds). Convenient, safe, and comfortable, the Fisher-Price Healthy Care Deluxe Booster Seat boasts a feeding tray that you can sanitize right in the dishwasher, making feeding times healthier and cleaner than ever before. Designed for children weighing up to 50 pounds, this handy seat also folds compactly and includes a carrying strap, so you can take it with you wherever you go. Snap-on lid keeps feeding tray clean wherever you go. Sanitize feeding tray and lid right in the dishwasher. 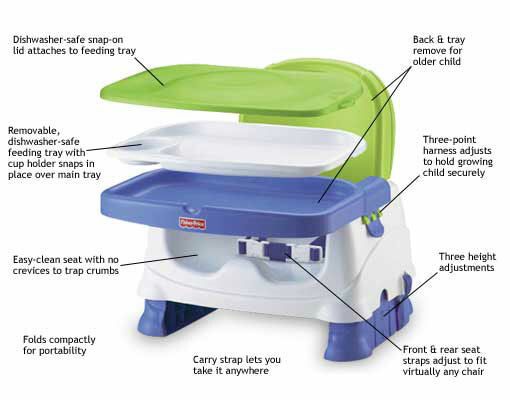 Made of sturdy and durable plastic, The Healthy Care Booster Seat is built to last. It also features three height adjustments that allow for a custom fit to any table, so you can easily move from feeding baby in the kitchen to having him join the family at the dining room table for mealtime. In addition, front and rear seat straps adjust to fit virtually any chair--a real plus when you're eating out--and the three-point harness keeps your child securely seated. 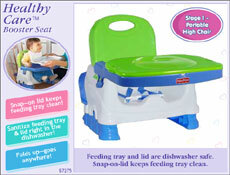 You can even remove the back and tray for older children. Finally, adjustable shoulder straps let you carry the seat from room to room, and the tray snaps off for traveling ease. Feedings can be messy, and busy parents have little time to spare for clean-up. That's why the Healthy Care Booster Seat has an easy-care design. First, with the plastic, snap-on lid in place, the tray will stay fresh and germ-free until you're ready to use it. And unlike traditional seats, this one-piece seat is entirely seam and crevice free, meaning there's no place for crumbs to hide. Simply wipe the tray and seat clean, or put the tray in the dishwasher, and you're done! Booster seat, tray, and carrying strap.